Since exploration began in August 2017 at its Soledad copper-gold-silver project in Peru, Chakana Copper (TSXV: PERU; US-OTC: CHKKF) has drilled four of seventeen confirmed breccia pipes, pinpointed another 12 targets, and tripled its land position in the district to 31 square kilometres. The company completed 25,211 metres of drilling in 94 holes in its first round of exploration at the project, 260 km northwest of Lima, and 35 km south of Barrick Gold’s (TSX: ABX; NYSE: GOLD) Pierina mine, and plans to drill another 20,000 metres this year, after it receives a permit (the approval of which is imminent, management says) that will allow it to drill from 120 drill pads. Despite the limitations of its existing permit, Chakana Copper has reported drill results from three of the four breccia pipes tested — Bx1, Bx5 and Bx6 — all of which contain pervasive mineralization and are vertically extensive, Kelley says. Bx1 has been drilled down to a depth of 490 metres and remains open. Highlights include 17-018, which returned 209 metres of 1% copper, 2.22 grams gold per tonne and 70 grams silver per tonne for a copper-equivalent grade of 3%. 18-059 intersected 233 metres of 0.85% copper, 1.4 grams gold and 57 grams silver for a copper equivalent of 2.24%, and 18-077 cut 244 metres of 0.91% copper, 1.4 grams gold and 56 grams silver for a copper-equivalent grade of 2.3%, including 194 metres of 1.13% copper, 1.3 grams gold and 65 grams silver for a copper-equivalent grade of 2.6%. All of the holes were drilled from surface. 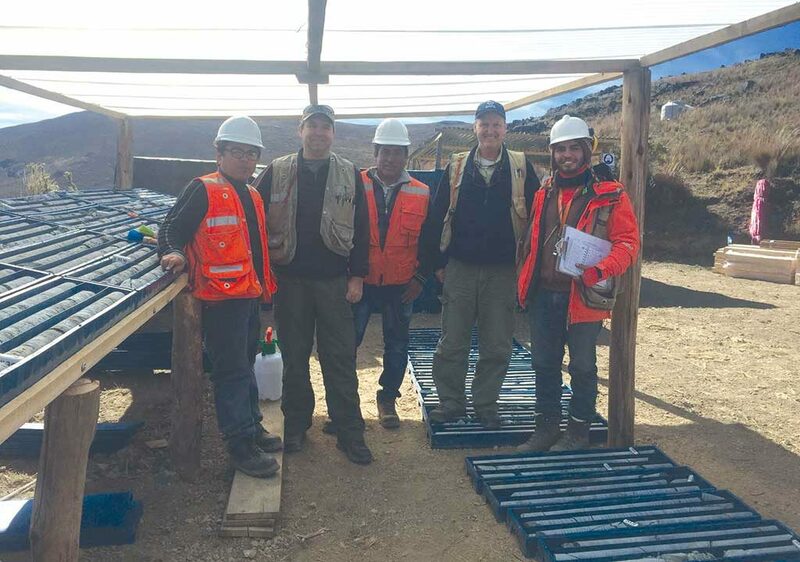 Chakana Copper’s project team at the Soledad copper-gold-silver project in the western ranges of the Andes in Peru in 2017. From left: Carlos Montoya, project manager; Steve Park, chief consulting geologist; Favio Medrano, field assistant; David Kelley, CEO; and Victor Torres, project geologist. Credit: Chakana Copper. In addition, Chakana discovered a completely separated and blind breccia body about 40 metres to the north of Bx1. Unlike the Bx1 pipe, which outcrops, the top of the blind pipe is 125 metres below surface. It’s possible that the two pipes coalesce at depth. Kelley says there’s a high probability of finding more blind pipes and that it’s not uncommon for tourmaline breccia clusters to contain as many as 100 pipes. The main Bx1 pipe also has very high margin grades, Kelley says, with typically tourmaline breccia bodies containing the highest grades at the margins, where breccia textures have higher permeability, due to the alignment of tabular breccia clasts, which form a shingle breccia texture. The Bx5 pipe, 1 km northwest of Bx1, is not as high-grade, Kelley says, but it’s still very good. Drill hole 17-041 returned 164 metres of 0.51% copper, 1.7 grams gold and 27.4 grams silver for a copper-equivalent grade of 2.8%, starting from 12 metres below surface. 18-080 cut 264 metres from surface of 0.71% copper 1.3 grams gold and 24.3 gram silver for a copper-equivalent of 2.7%, including 234 metres of 0.79% copper, 1.30 grams gold and 21.6 grams silver for 1.82% copper-equivalent. Results from Bx6, 500 metres north of Bx5 and 1000 metres northwest of Bx1, and traced down to a depth of 800 metres, include 18-103, which intersected 29 metres of 0.76% copper, 1.2 grams gold and 227.7 grams silver for 3.52% copper-equivalent starting from 64 metres downhole, and 18-107, which returned 14 metres of 1.92% copper, 3.8 grams gold and 13 grams silver for a copper-equivalent grade of 4.54%, starting from 86 metres downhole. Bx6 is the northernmost and highest elevation outcropping breccia body identified to date. The northern margin of the pipe remains undrilled and requires about 2,500 metres of drilling to confirm the geometry and grade distribution of the pipe. Looking ahead to its 2019 drill program, which starts in May, Kelley says the company has over 60 targets to explore based on a surface exploration program consisting of detailed mapping of rocks and alteration, rock and soil sampling, and time domain electromagnetic surveys around each of the breccia targets.